Over the summer, the Portland Bureau of Transportation (PBOT) commenced a pilot program to test the use of electric scooters as an alternative mode of transportation in Portland. We started seeing e-scooters on Portland streets around the end of July, and the program runs through November 20, at which time we’ll find out whether the PBOT deems e-scooters safe and efficient or a dangerous nuisance. With the evaluation period not yet halfway complete, there have been several e-scooter accidents in Portland—par for the course or an indicator that e-scooters are more hazard than help for Portland commuters? Portland’s e-scooters are rentable via app, with the goal of easily and cheaply zipping riders around the city. You must wear a helmet and use the bicycle lane or vehicle lane. Sidewalk riding is prohibited. In other words, think of e-scooters as vehicles. You may even be charged with a DUI for riding under the influence of intoxicants. When parking an e-scooter, it’s important to leave it on the sidewalk, close to the curb, so it’s not blocking the sidewalk, bike lane, or vehicle lanes. The scooters cost $1 to unlock and $.15 a minute to ride. Much like bicycles and motorcycles, e-scooters make riders vulnerable to serious injuries in the event of an accident with a motor vehicle. A person riding an e-scooter was even hit by a TriMet bus in northeast Portland, an extremely frightening and potentially fatal accident. In another incident, two people trying to rent e-scooters propped on the sidewalk were injured during an alleged hit and run accident in downtown Portland. And in what may be the first e-scooter-related death, a 24-year-old man died after apparently wrecking the e-scooter he was riding and sustaining a traumatic brain injury. 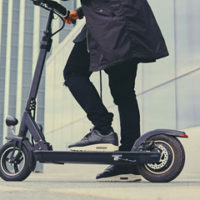 In response to the growing number of e-scooter accidents (12 as of this writing), the PBOT says it will now attach flyers to the scooters with safety instructions (what one might argue is a low-tech solution to a high-tech problem). Any personal injury or wrongful death claims arising from e-scooter accidents will likely be as challenging as regulating their use, as there are a lot of players potentially involved, from at-fault driver(s) to insurance companies, the PBOT, the city of Portland, e-scooter manufacturers, helmet manufacturers, and more depending on the circumstances surrounding the accident and injury. Our Vancouver law office stays abreast of local news and developments that may affect Portland and Vancouver area residents. If you have been injured in an accident involving an e-scooter, give us a call at 360-693-2119. Electric scooter accident attorney, John Lutgens, can help you make successful claims against all the parties who may be liable for your injuries and damages.